Sculpted abs, bulging biceps and a ripped back is every bodybuilder’s dream. Isn’t it? The fitness industry has been driving the world into a frenzy. The strange thing is that the word ‘fitness’ means different things to different people. For some, it’s lifting weights, and for some, it is staying at the peak of health which doesn’t necessarily mean having six pack abs. This article is for the former lot. Especially to all those folks who dream of those big bulging biceps! What is an EZ Curl Bar? The mother of all bicep builders is here! The EZ curl bar or the Easy Curl bar is a bar which is shaped like the alphabet ‘W.' This difference in profile helps the user keep his wrists at a more neutral and less supinated position. The EZ curl bar isolates the biceps with this positioning and ensures that it gets a good workout. 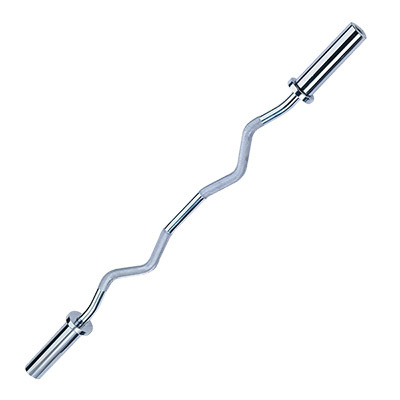 It is ideal for performing curls and hence the name, EZ Curl bar. Just like barbells, EZ bars also come in the standard and Olympic varieties. Before looking into the types, here is some common terminology concerning bars. Knurling: Knurling is the etching on the bar which helps the lifter by providing an exceptional gripping surface. Two sets of diagonal lines cross over each other forming many tiny little diamonds on the bar. Knurling is present in all kinds of bars, beginning from standard bars to our very own EZ bars. Whip: When weights are added to bars, there is temporary bend in the bar. Once you remove the weights, the bar gets back to its form. This feature of the bar is called whip. Tensile Strength: In simple terms, tensile strength is the amount of tensile stress the bar can withstand before breaking or bending. Tensile strength is one of the most important measures which reflect the bar’s performance and quality. Sleeve Spin: The spinning action of the sleeves of the EZ bar can help the lifter in a number of ways. Firstly it reduces the burden of the plates and secondly, it reduces the chance of injury and ensures you have a safe workout. 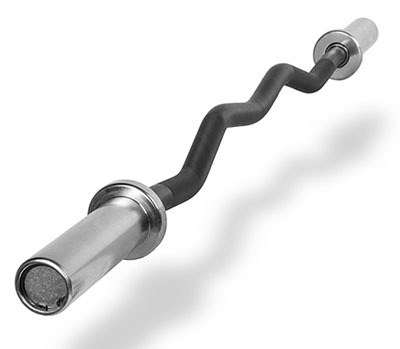 Let’s take a look at the types of EZ curl bars. The standard EZ bars are light in weight. They usually weigh 13-18 lbs and can work with standard plates which are 1-inch. These bars are usually 48 inches long and have limited whip. The Olympic EZ bars are made of superior quality of steel and have a better whip. These bars are usually 52 inches long and weigh 18-25 lbs. The sleeves of the Olympic EZ bars are 2-inches; hence only 2-inch Olympic plates fit here. Olympic EZ bars have rotating sleeves on the ends which allow the weights to freely spin and hence less stress on the lifter’s joints. With the fitness industry growing massively, there are a number of companies which manufacture fitness equipment. To make your job easy, we are here to help you with fitness brands that manufacture the top EZ curl bars. XMark fitness has been in the fitness industry for a long time now. It has established its name with its inherent craftsmanship and functionality. The other factors that put X Mark on the top are attention to detail, ergonomic design and most importantly providing an exceptional customer service. XMark fitness also offers a lifetime warranty on most of the equipment it manufactures. Another leading brand in the fitness industry is CAP Barbell. The brand has been for 25 years producing more than 1000 products in over 30 categories. CAP provides great quality products at competitive prices which give the brand a significant advantage over the other brands. It also performs a regressive product analysis which makes the equipment exceptional. The Champion barbell fitness brand manufactures a variety of fitness equipment but is known for the barbells and strength equipment it manufactures. The Ultimate series is specially dedicated for bars and barbells. Champion barbells have a white powder coat finish which makes it quite exceptional. It also provides a lifetime warranty on welds. 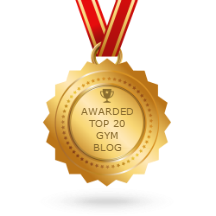 BodySolid has been around in the field of fitness for more than 20 years and has been producing quality gear and providing excellent customer service. Body Solid also has other brands under its umbrella such as Powerline, ProClubLine, and ProDual. The parent company of Marcy is Impex which has was established in 1982. Impex has a number of brands such as Apex, HERS, Bionic body, SteelBody, and Marcy. Each brand caters to a specific category of fitness equipment. It offers innovative quality products at competitive prices. Troy barbell and fitness produces quality-engineered free-weight equipment with unmatched aesthetics and durability. Troy meets this quality by integrating people, technology, and experience. Troy has three distinct lines of fitness equipment manufacturing units namely the USA, VTX, and TROY. The XMark Chrome Olympic EZ Curl Bar takes the first place in the list. The price range of this EZ bar is from $80-$130. The bar is 28mm long and has medium knurling to allow a secure and comfortable hold. Weighing 22 pounds this plate can be loaded with a maximum of 400 pounds. The bar has a manganese phosphate black coating which makes it resistant to corrosion. 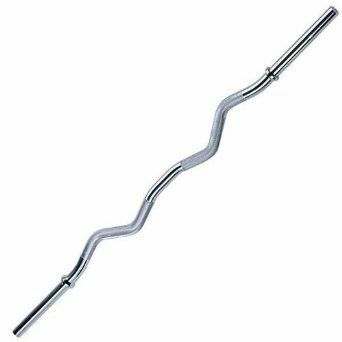 The CAP Barbell EZ curl bar is made of solid chrome steel featuring Olympic style ends which can accommodate the 2-inch Olympic plates. The bar comes with screw type collars which are an advantage. There is knurling on both angles and also has a smooth finish which ensures easy removing and fixing of plates. The bar can handle a maximum weight of 200 pounds. 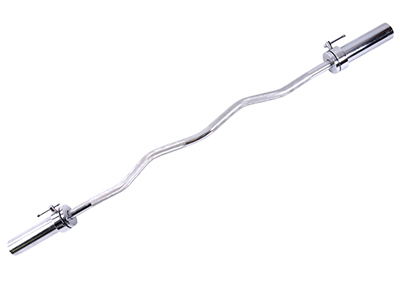 The Body Solid EZ bar is a chrome finished one, which is 47 inches long weighing 18 pounds. The bar is an Olympic designed one and has sleeves that rotate ensuring easy placement of weights. The bar comes with angled dual grips that ensure minimum stress on the lifter’s elbows and wrists. The dual grip which is biomechanically designed targets the inner and outer bicep muscles. The Champion EZ curl bar is made of chrome plated steel and has one-inch diameter all way along including the sleeves. The bar can handle a maximum weight of 220 pounds. The bar has a good amount of knurling which provides the lifter with a good grip. The bar comes with spring collar units which make it easy to fix and secure the weight. The bar weighs 21.4 pounds and offers good value for money. The Troy barbell Olympic bar is the most expensive ones of the lot. It has a stylish black finish with deep diamond knurling for a secure and comfortable grip. The specialty of Troy bars is the variety of lengths in which it comes. The length ranges from 47 to 60 inches. The shorter ones have roll pinned sleeves, and the longer ones have bolted sleeves. The bar also comes with a 5-year warranty. Using the EZ curl bar can take a bit of getting used to. The shape of the bar may seem peculiar to people who have no prior knowledge about curl bars. The first and foremost thing about using EZ curl bars is your position. A wrong position can leave you injured. Here are a few things to keep in mind about using EZ curl bars. Make sure that your back is straight and that you are standing upright. The next important thing is to keep the head in a stable position. Leaving your head in an unstable position can affect your entire body’s posture. Make sure your hands are gripping the bar tightly essentially on the knurling as it provides a good hold. The two-headed muscle group located at the front of the arm which is made up of a short inner head and a long outer head is the biceps brachii. The supinated underhand grip while doing the biceps curl emphasizes on the biceps brachii and gives it a good workout. The muscles located underneath the biceps brachii is the brachialis. This is the sole muscle responsible for the elbow flexion. The pronated grip during the biceps curl, exercise the brachialis and make it stronger. This muscle is located on the outer side of the forearm. This muscle also contributes towards elbow flexion. The semi-pronated grip of the biceps curl can benefit this muscle. The multiple stabilizer muscles present in the shoulders, scapula, wrists all get a good workout by using EZ curl bars. The anterior deltoid muscles which stabilize the shoulders also get an exceptional workout during the biceps curl. There are several EZ curl bar exercises which can also work your back muscles. The reverse grip bent over row works all the major back muscles. The middle trapezius and rhomboids which are present in the back can become strong during the retraction movement of the EZ curl exercises. The curve in the bar keeps the lifter’s hand in a neutral position which reduces the stress placed on the wrists and elbow. 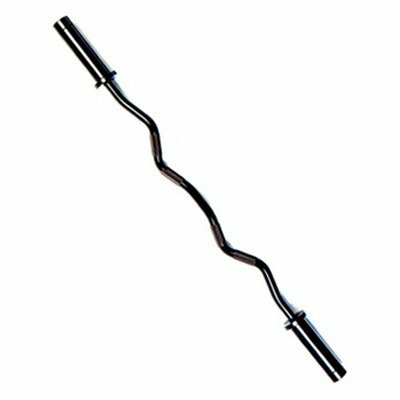 The profile of the EZ curl bar allows the arms to be in a natural workout position. It even finds use in sports therapy. Following are some of the most common EZ bar workouts. Grip the bar on the inside of the curves and do the EZ bar curl exercise. This workout focuses on the forearms. You can also attach bands to either end of the bar and do the curl. The EZ bar and straight bar vary in weight, shape and hand positioning. The EZ bar makes the workout easier when compared with the straight bar, but it might be less effective. The EZ curl is a much-needed equipment in any home gym. For people who are in love with big biceps, this bar can be a blessing in disguise. Now that you know everything about EZ bars go ahead and take your pick!